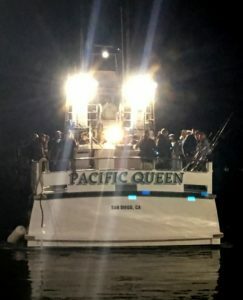 Last week I wrote how I was getting ready to head out on the Pacific Queen for a 1.5-day trip targeting bluefin tuna. 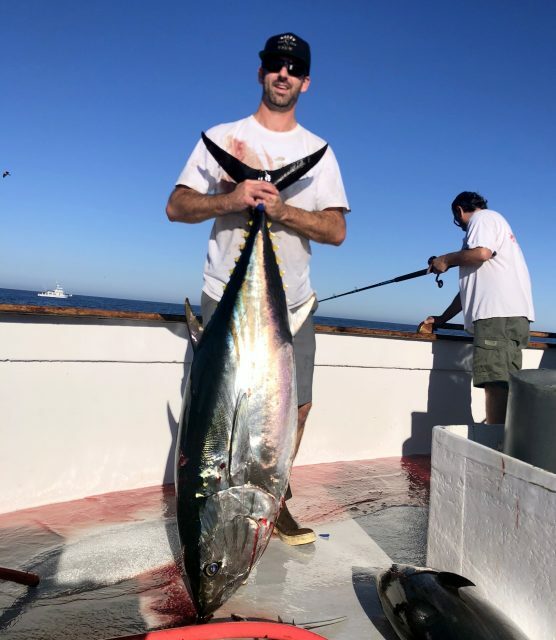 I was excited about our prospects because in the weeks leading up to our trip, the fish were biting bait and it was happening on reasonably heavier line to give you a shot at landing them. The weather outlook was good, so hopes were high as we departed Fisherman’s Landing in San Diego last Friday night. 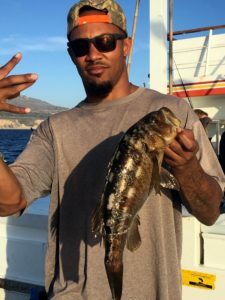 We went long to the far side of San Clemente Island where the fleet was concentrated chasing these fish. The day got off to a relatively quick start when Capt. Gavin Harbour located a school on the sonar and we started a drift on them. The drift was a long ways short of being wide open, but it was a steady plunker bite with maybe 1 or 2 fish going all morning. As advertised, they were biting a little heavier line with anglers getting bit on 30# and 40# fluoro tipped line. The quality was excellent with the smallest ones eyeing out at maybe 40# and the bigs topping out at just over 100#! 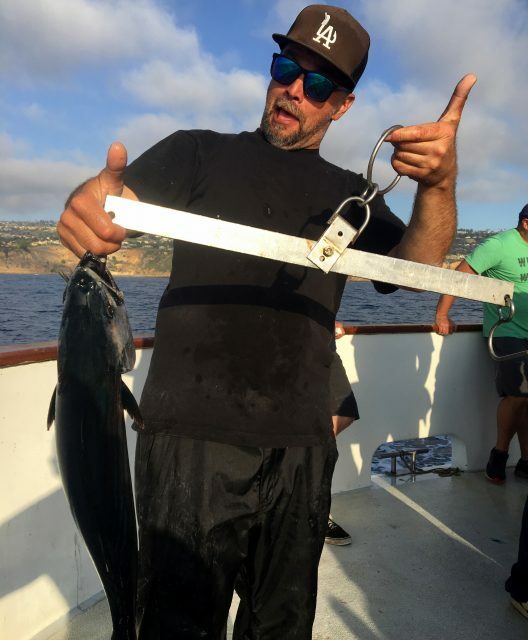 There didn’t seem to be a lot of rhyme or reason to who got bit (Yes, I couldn’t buy a bite), other than long time reader, Tom Plass, who converted 3 bites into 3 fish. He managed to land one of the 100+ pounders on 30# (above). Tom also hooked and handed a 4th that was lost. Tom bucked our pre-trip instructions and was using a J-hook. He belly hooked his baits. Not to say circle hooks on nose-hooked baits didn’t work too, but his combination was the best one on our trip. Our tally for the morning was 14 fish. After the morning plunker bite ended, we went into a long dry stretch. 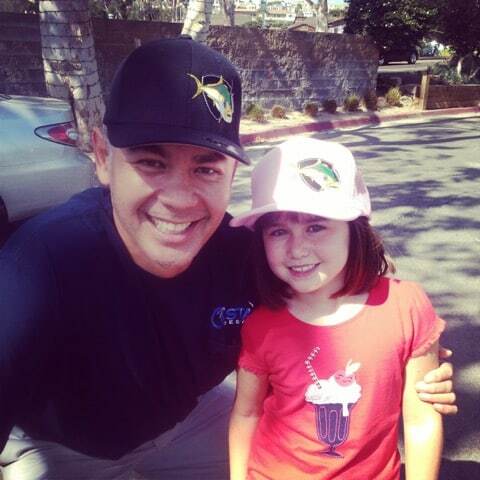 We actually went almost all the way to the Cortes Bank looking before circling back toward Clemente. With the island in view again, a breezer was spotted and we raced forward to get on it. As we edged closer, breaking fish got our collective hearts racing as everyone stationed themselves, rods in hand, waiting with anticipation by the handwells. This was going to be our big shot! As we approached the school, Gavin instructed crewmember Zeke Cruz to pour the chum on heavy. We committed a majority of our bait dumping FOUR big transfer scoops of sardines over the side. They responded. Fish started crashing on the surface inside our circle. Then tragedy…two other sportboats ran through our wake on top of all our bait and sank the school! It was the most savage disregard of any and all professional courtesy and/or ethics by another sportboat captain I’ve ever witnessed. It effectively ended our trip. What’s The Local Angle, Joe? Suffice to say I had a pretty bitter taste after that trip. Capt. Gavin and his crew were great, and I can live with the results. Bluefin being bluefin, it just is what it is. The way it ended though, and personally taking a skunk left me needing to get past it quickly. Going local felt like the right prescription. Yesterday, I rode the Native Sun out of 22nd Street Landing in San Pedro. Capt. Jeff Walker let me know he had some live squid and a hunch on where we might find some yellows to bite it. Works for me. My buddy Richie Landerer, who was on the Queen trip also, decided to join me. We headed up to Santa Monica Bay. The plan was to target bonito in the morning, then take our squid to the kelp line to catch bass and maybe get lucky finding yellows in the afternoon. Jeff’s plan was a winner. It took a minute, but we got stopped on the troll on a school of bonito mid-morning. I dropped a large Krocodile back on the slide and almost immediately got bit. I was reeling it in and it came off once it got within view. One crank later though, I saw another one smash it and I was on again. They hung around for only about 10 minutes, but Richie and I got 3 each. Skunks off! We had one more stop like that before changing up and heading inshore. Again, it took a couple tries to find the right spot, but we did. Funny thing about it, they wanted the fresh dead and not the live squid. Once we figured that out though, it was game on. There wasn’t a ton of legals in the mix, but who’s going to complain when you’re getting bit on every bait? There was one “might’ve been yellow” but it never got landed. And I almost forgot to mention…all you wanted on short, surface iron cuda. Bonito, bass and barracuda added up to a great day on the water. Richie ended up getting jackpot. Our saltwater therapy was successful. Thanks so much to Jeff and crew for providing a great trip. It was also really nice to see and hear the level of communication and cooperation between Jeff and some of the other local captains (Jeremy Maltz on the Spitfire; and Andy Siratt on the Enterprise). Like I’ve said before, when in doubt – GO LOCAL!